Recently, I received a newsletter from the band Aftershok regarding their upcoming release, Burning Chrome. This will be the follow up to Aftershok's first album, Unfinished Business. Aftershok is the new band featuring vocalist Vic Hix (Shok Paris). Naturally, the anticipation of a new Aftershok CD drove me to listen to some old Shok Paris albums. I've always felt that Shok Paris were one of the most overlooked, yet talented bands of the 1980's. It's safe to say that several worse bands made it, while Shok Paris was relegated to the underground. Shok Paris released three albums during their time, Go For The Throat, Steel & Starlight, and Concrete Killers. 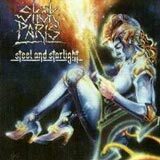 Steel & Starlight is probably their most well know album, and certainly my favorite of the three. This album is straightforward heavy metal in the vein of Dio, Judas Priest, and Saxon. Somehow, this album just doesn't sound tired or aged, even though it was released in 1987. Steel & Starlight features eleven classic metal tracks, with an anthemic quality that easily gets the neck moving right from the start. Vocalist Vic Hix has a very charismatic and melodic vocal style, oftentimes sounding like the long lost twin brother of Ronnie James Dio. There is no doubt that Hix's vocals are a defining quality of this band. His voice is full and powerful, and he is able to hit and sustain the higher notes when necessary. As I said, the Dio comparison is very easy to hear, a compliment to Vic. The guitar sound employed on this album is very thick and rich. The riffs are full and forceful, very much at the forefront of the sound, reminding me of Screaming For Vengeance era Judas Priest. The guitar tandum of Ken Erb and Eric Marderwald lash out some excellent dual guitar harmonies and flamboyant dual solos throughout the album that blend together so naturally. Once you hear this album, I think you'll agree that some of the guitar harmonies and solos are just as addicting as the melodies. It's pretty obvious to me that this pair had great chemistry in the studio, very much on the same page stylistically. For me this is an intangible quality of an album that separates excellent albums from masterpieces. As any fan of 80's metal can attest, many albums of this era were a little bit too light on the bass, just ask Dee Snider about the production on Stay Hungry! Fortunately, Shok Paris bassist Kel Berkshire was not ignored during the production phase of Steel and Starlight. Kel gives the driving riffs of Ken and Eric a steady backbone, providing a well rounded and hard edged sound for the album. Come to think about it, this album has surprisingly high quality for a metal album released on a smaller label during the 1980's. I'm not going to compare the production to that of Edguy, but it is professional enough to not sound dated almost 20 years after its release. If anthemic, classic heavy metal is your thing, Steel and Starlight is an album that you should own. Shok Paris were able to combine the catchiness and melodic quality of the hard rock scene of the time with guitar driven heavy metal, resulting in an album that has stood the test of time, refusing to sound boring or mundane even today. As far as songwriting and musical talent goes, I think everything just clicked for the band on this album. You can almost feel the energy emanating from your speakers with every drum hit, riff, and vocal line. Although Vic is fully dedicated to Aftershok these days, Shok Paris has semi reunited, playing as recently as June 25th at the Bang Your Head Festival in Balingen, Germany. Hopefully, this activity in the Shok Paris camp will lead to the reissue of the band's back catalogue, giving fans who may have overlooked this band for some 15-20 years a chance to hear some great classic heavy metal.